Fintie, a quality product within your reach! -Available in a variety of vibrant fashion designs to suit for your taste. Eyewear becomes an universal accessory that matches your personal style. 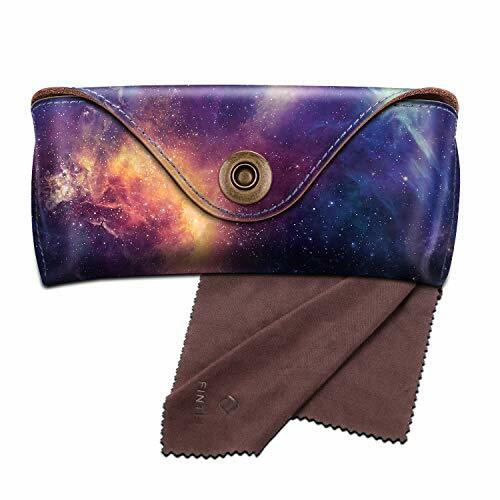 Fintie eyeglasses case combines functionality and fashion to provide you with convenience and stylish elements to dress up the glasses and match your outfit. We're so confident you're going to love Fintie, we offer a 100% satisfaction guarantee. If you don't like the product for any reason, we'll refund your money. Fits most standard sized sunglasses, prescription glasses or reading glasses. Case Size: 6.7 x 3.2 x 2 inch. With secure snap button closure, the slim eyeglasses case provides excellent protection from dirt, scratch and bump. Built with center support to keep the glasses in place. Made of premium vegan leather exterior and soft microfiber interior with perfect sturdy stitches, this glasses pouch features ultra light weight and portability. Perfect combination of fashion and elegance, adding a subtle touch of style to your outfit! Comes with a cleaning cloth to always keep your lenses smudge free.